Welcome to TortoiseHg and the Mercurial! TortoiseHg is a set of graphical applications and Windows Explorer shell extension that serve as a friendly front-end to the Mercurial distributed version control system (DVCS). 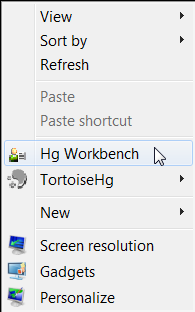 You can start the Workbench from the Start Menu, or by right clicking on the Desktop and selecting Hg Workbench. All you have to do is right click on the right folder or files in Explorer, and select a context menu entry. Type the appropriate commands from any command line interface, in the form thg <command> [options]. In this quick guide we would like to make you get started using the Workbench application, but we will also indicate how to do the same with the other possibilities. 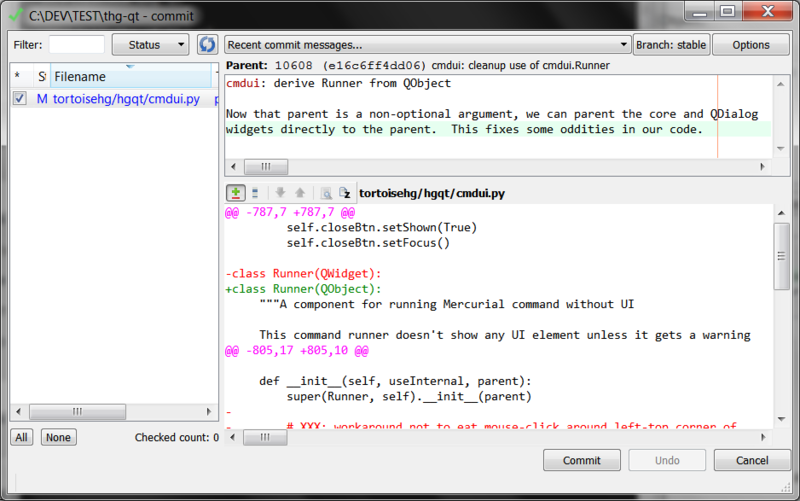 Mercurial commands are also available from the standard hg command line application. Your first step should be to make sure that you are correctly identified to TortoiseHg. You do this by opening the global settings dialog. 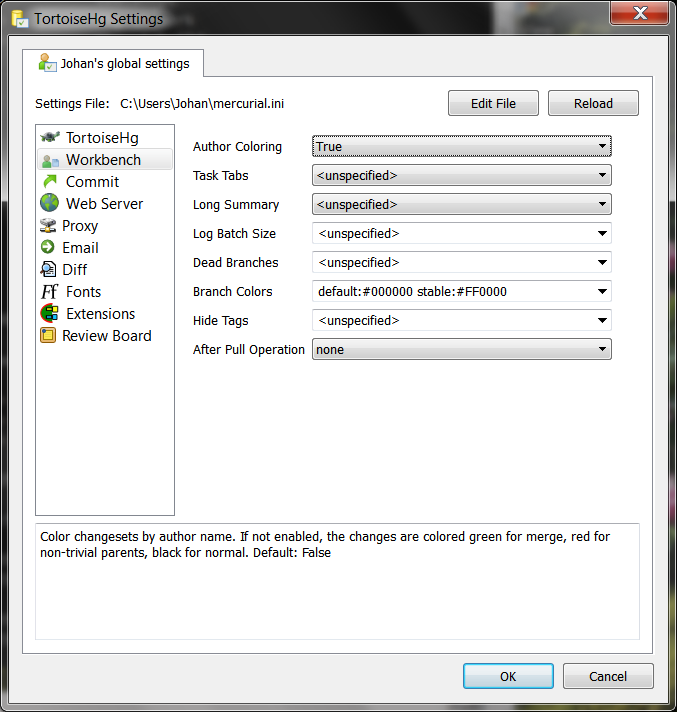 This opens the TortoiseHg settings dialog, editing your global (user) configuration. First select the Commit page and enter a name in the Username field. If you neglect to configure a username TortoiseHg will ask you to enter one when you try to commit, which is the first time a username is actually required. The email address is stripped when viewing history in the revision history viewer, and the built-in web server obfuscates email addresses to prevent SPAM. Next, select the TortoiseHg page and select the Three-way Merge Tool entry. In the drop down list you will find all of the merge tools detected on your computer (kdiff3 is provided by the Windows installer) and a number of internal merge behaviors. Select your preferred merge tool. If you prefer for TortoiseHg to also use your selected merge tool for visual diffs, you can leave the Visual Diff Tool unspecified. Otherwise, select your favorite visual diff tool from the drop down list of detected visual diff tools. If there are no options in either drop-down list, you must install a diff/merge tool that is supported by our mergetools.rc or configure your own tool. If you installed TortoiseHg from source, you need to add our contrib/mergetools.ini file to your HGRC path in some way. One approach is to %include it from your ~/.hgrc file. Feel free to configure other global settings while you have the dialog open. You will have the chance later to override these global settings with repository local settings, if required. Click the OK button to save the changes you have made and close the settings dialog. Most TortoiseHg settings changes are noticed immediately, but loading or unloading extensions usually requires restarting all open applications for the changes to take effect. Mercurial supports many different collaboration models. This chapter describes just one of those models: a single central repository. The central repository model does not scale as well as other models, but it is the most familiar to those coming from other revision tools and thus is the most common approach people start with. To get started, suppose you volunteer to create the central repository. There are ways to convert non-Mercurial repositories into Mercurial repositories, but this example assumes you are starting from scratch. You can do this from within the folder you want to create the repository in, or enter the correct path in the dialog. You only need to do this once in the root folder of your project. We suggest you keep Create special files (.hgignore, …) checked, and do not check Make repo compatible with Mercurial < 1.7, unless you have a strong reason to do so. After pressing Create, Mercurial creates a subdirectory in your project folder named .hg. This is where Mercurial keeps all its version data. It is called the repository or store, while the directory containing the source files is called the working directory. You never need to specify the .hg directory when running commands, you only need to specify the working directory root. It is mentioned here just so you better understand how Mercurial works. The new repository will also be added to the RepoRegistry when you perform this operation from the Workbench. It is dangerous to manually edit the files in .hg directory, repository corruption can occur. .hg/hgrc is perhaps the only exception to this rule. Perhaps you already created one or more repositories. As you can manage multiple repositories in the Workbench at the same time, you can add these existing repositories by selecting File ‣ Open Repository… from its menu, and selecting their folder. Or you could drag their folder from Explorer into the RepoRegistry pane. Workbench: goto the Commit task tab, rightclick on the file, and select Add from the context menu. This will change the status indication of that file into ‘A’ and the filename will turn green. Explorer: select TortoiseHg ‣ Add Files… in the context menu. A dialog will open for you to check the selected files and accept the add operation. You can also open the status tool by selecting TortoiseHg ‣ View File Status. Check the files you want to add and select Add from the file context menu. Or skip adding new files as a separate step and have the commit tool add them implicitly. The commit tool is very similar to the status tool and allows you to do all of the same tasks. In this tool you can add and commit an untracked file by just checking the file and pressing Commit. You may have some files in the foldertree of your repository that you don’t want to track. These can be intermediate results from builds f.i. that you do not wish to always delete immediately, or files your editor generates, etc. You can mark these files as ignored in some different ways too. Workbench: goto the Commit task tab, rightclick on the file, and select Ignore… from the context menu to open the ignore filter dialog. Explorer: select TortoiseHg ‣ Edit Ignore Filter. Command line: type thg hgignore to bring up the ignore filter dialog. You can also launch the ignore filter from the status tool (the menu option is named Ignore). Choose a file from the list or manually type in a Glob or Regular expression filter and then press Add. Changes to the ignore filter take effect immediately. The .hgignore file, contained in the working directory root, is typically tracked (checked in). It is good practice to not have many unknown files in your working directory, as it makes it too easy to forget to add vital new files. It is recommended that you keep your .hgignore file up to date. Write a commit message, select the files you wish to commit, then press Commit. Your previous commit message will be in the message history drop-down, so you do not have to type it in again from scratch. Now you are ready to share your work. You do this by making a copy of your repository in a public location that everyone in your group can read. Mercurial calls this copy operation cloning your repository. Then enter the destination path, and click Clone. When you create a clone for the purposes of generating a central repository there is no reason for that clone to have a working directory. Checking Do not update the new working directory under Options will prevent Mercurial from checking out a working copy of the repository in the central repository clone. It will only have the .hg directory, which stores the entire revision history of the project. Other team members can clone from this clone with or without a checked out working directory. You want to start collaborating with your team. They tell you something like fetch the repository from x. What does that mean? It means that you want to make a copy of the repository located at x on your local machine. Mercurial calls this cloning and TortoiseHg has a dialog for it. Then enter the destination path, and click OK. This time you do want to update the working directory because you want to work on the project, under Options uncheck Do not update the new working directory so Mercurial updates the working directory with the tip revision in your new clone. Suppose you’ve introduced some changes. It is easy to discover what pending changes there are in the repository. Any files marked with ‘A’ (added, green), with ‘?’ (unversioned but not ignored, fuchsia), with ‘M’ (modified, blue), or with ‘!’ (removed, red) indicate pending changes that should be committed. The Commit task tab in the Workbench gives you a way to see differences within the files, or you can use your visual difference tool (kdiff3). Mercurial allows you to commit many changes before you decide to synchronize (share changes) with the group repository. Folders or files in Explorer marked with one of the icons below are another way of indicating pending changes. You can traverse the directories to find specific changes and commit them from Explorer. Though it might be quicker to do that from the Commit task tab in the Workbench. Commit your changes to your local repository (see above). Pull changes from the group repository into your repository using TortoiseHg ‣ Workbench or thg log, select the Sync task tab, choose the path to the group repository in the syncbar and then click the Pull button. If some changesets were pulled, merge those changes with your local changes and then commit the merge into your local repository. From the revision history viewer (TortoiseHg ‣ Workbench or thg log) open the context menu over the changeset which you want to merge and select Merge with local…. Finally, in the merge dialog, press Merge and then Commit. Ensure your merged work still builds and passes your extensive test suite. Push your changes to the group repository, TortoiseHg ‣ Workbench or thg log, select the path to group repository and then click the Push button. Which may sound complicated, but is easier than it sounds. Merges can be safely restarted if necessary. Mercurial makes collaboration easy, fast, and productive. Learn more at Mercurial’s wiki.